At 11:42 am Monday, Liberal firefighters were dispatched to 341 E Oak St. for a reported residential structure fire. First arriving units at 11:45 am reported the home as fully engulfed. The lone occupant at the time of the fire had been awakened by smoke filling the residence. He was able to self-evacuate suffering from minor smoke inhalation. Firefighters mounted a defensive attack to extinguish the bulk of the fire. At that point they were able to make entry and complete extinguishment and begin to overhaul hot spots throughout the home. The fire was declared under control at 12:11 pm. The home is a total loss. The fire appears to have started in a bedroom area near the rear of the home. Due to extensive fire damage the exact cause is unable to be determined however it is believed to be accidental in nature. 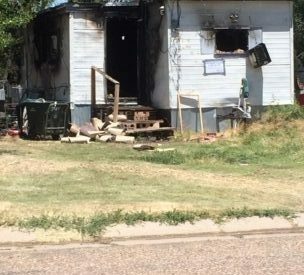 The occupant of the home was treated and released at scene by Seward County EMS personnel. The fire department responded with a total of 13 personnel, two engines and a medical/rescue unit. Also assisting at the scene were the Liberal Police Department, Liberal Building Department, Liberal Water Department, Seward County EMS, American Red Cross, Southern Pioneer Electric & Black Hills Energy. All units were fully returned to service at 2:20 pm.